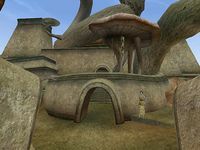 The Vos Chapel is a small Tribunal Temple in the center of Vos. This small chapel in Vos is mainly notable as the home of one Yakin Bael, who is the Master trainer for Restoration. Additionally, Eldrilu Dalen offers a variety of ingredients, potions, and spells for sale, as well as offering spellmaking services. There are no shrines in this temple, and very little else of interest. This page was last modified on 8 September 2018, at 04:15.